A perfect spot to enjoy Georgia's hill country, Helen, Georgia offers everything to make a rural adventure memorable. Take the whole family on a getaway from the busy city life and stay at Helen vacation rentals conveniently centered among nature's best outdoor activities. The family can settle in for a few hours at Helen rentals before embarking on the next outdoor adventure, so everyone can find a balance between staying active and immersing themselves in relaxation. Listen to wind rustling in the trees and the water trickling over the rocks, but there are many more activities in Helen. Set out from Helen cabins and hike the many nature trails, such as the one near Ana Ruby Falls, and the rugged trails of Unicoi State Park. Horseback riding adventures and mountain biking are other activities that can pick up the pace. Take the family on a daring adventure to explore an old gold mine. Some time out on the Chattahoochee River afterward will make everyone feel refreshed. Even cast a line and catch some local fish, which you can take home and broil up in the kitchen of Helen cabin rentals. The local area is home to many country cooked cuisines, with a wide variety of choices from restaurants in town to those closely associated with the area's wine country. Family restaurants as well as cafes, delis, and bistros make up the many choices of dining. The budget savings from staying at Helen rentals can be put to good use at a country restaurant, and a family vacation isn't complete without at least one hardy meal. Once you return to Helen vacation rentals the open space will help you relax, so you can digest a big meal easier than at a typical hotel or motel room. For some classic family fun, take a couple hours to play some miniature golf. A taste of local wildlife can then be experienced at the Black Forest Bear Park & Reptile Exhibit, right at the heart of the town of Helen. There are several museums in town as well, which cover everything from arts and crafts to pottery to history. A tour of the museums can be complemented by browsing the many clothing, household products, and food shops. You'll spend much less at Helen rentals than at a hotel or motel, even in the mountains, so use the savings to take home a little bit of White County when you leave. 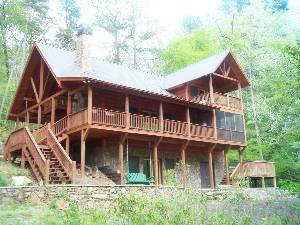 Secluded destinations like White County, Georgia seem like an easy getaway, but you need to be safe and book with an owner early to get the full experience of Helen cabin rentals. Experience the foothills of the Blue Ridge Mountains in style and with comfort that is rarely part of the hotel or motel itinerary. The options of Helen rentals allow a choice of affordable accommodations the entire family will feel comfortable in, and leisurely set out for daily adventures in the wilderness. Check out nearby Blairsville , Blue Ridge , Cashiers , Hiawassee , Highlands , Lake Nantahala , Murphy , Nantahala .